Want The No.1 Secret To Having Healthy Relaxed Hair? Try This! 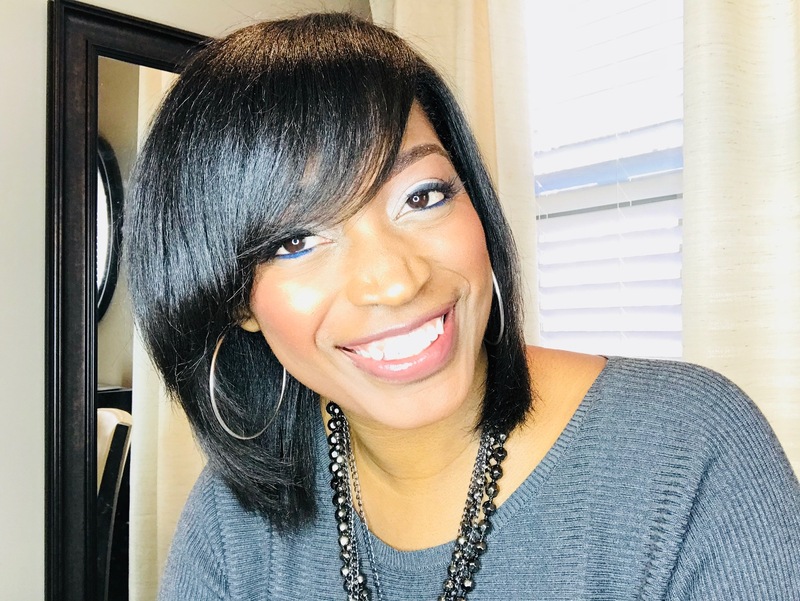 As a professional hairstylist, one thing I see more often than I would like is women with relaxed hair who also have damaged hair as a result of getting their relaxers every six weeks. 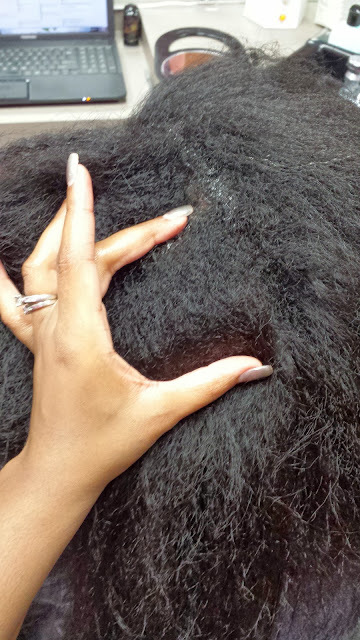 If you get your relaxer every six weeks then it is not a coincidence that your hair is damaged. 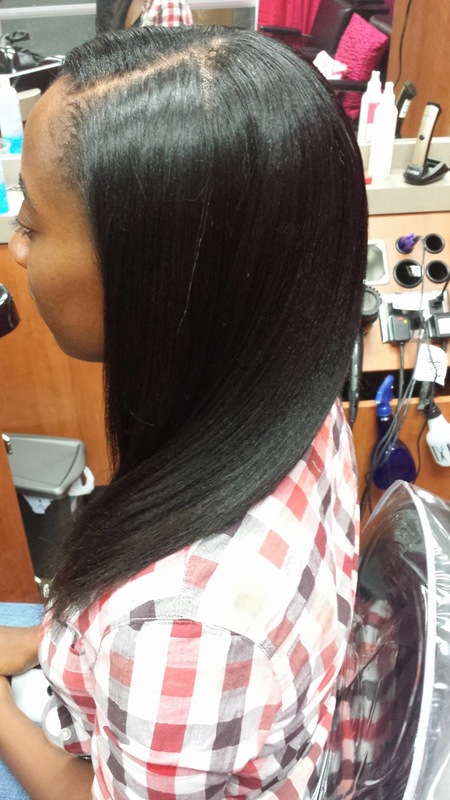 If you want to have thick, long, healthy relaxed hair you will HAVE to stretch your relaxers out. There is no other way around it. In the picture above, the two young ladies are clients in my salon that are relaxed. I only relax their hair about every 4-5 months. In that time, they will have grown on average about 2-3 inches of new growth. 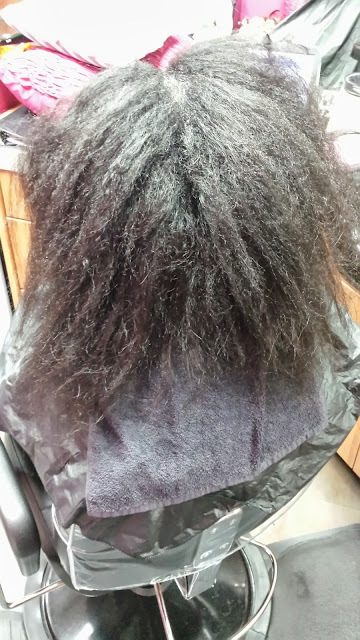 For the other client I have pictured above, she is also relaxed and still has lots of hair because she stretches her relaxers out to five months. See how much hair she has? Yes, even with all of this hair she still managed to stretch her relaxer out to five months. If she can do it, anyone can! I started prepping her hair by basing her scalp really well. She previously had some braids so I also began detangling her hair. Take a look at how much new growth she had. 3 inches of new growth! That is roughly three inches of new growth. 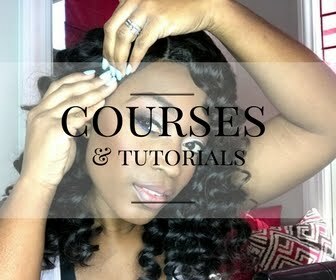 This is how much your hair can grow when you begin stretching your relaxers out. It allows your hair to grow out more so that you have enough hair to relax without it overlapping onto previously relaxed hair. 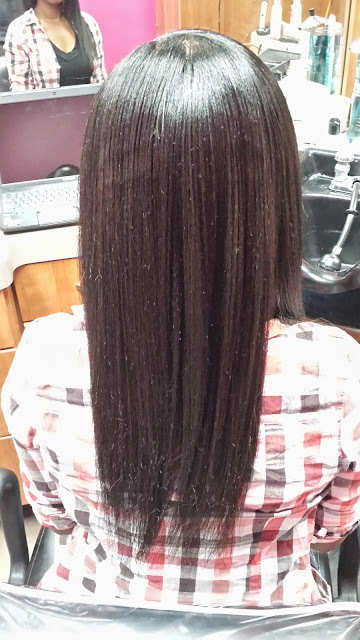 When you stretch your relaxer out this much, it is highly unlikely that you will have any damage to your hair from relaxers versus if you only wait six weeks. All she will need to do to maintain this style is to wrap it every night by using her silk scarf. That is one of the best things about wearing a wrap hairstyle. It is so easy to take care of and allows you to actually sleep well instead of trying to sleep cute. And I don't know anyone who enjoys sleeping cute! And guess what? It didn't even burn! Remember, your relaxer should never burn unless you have some type of problem with your scalp like extreme scalp sensitivity. 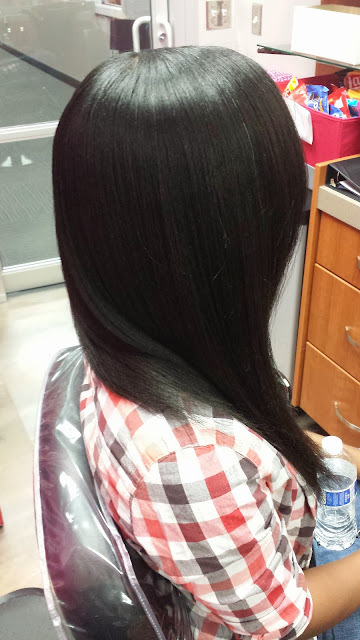 It is never a good idea to scratch or brush your scalp before getting your relaxer because it could increase your chances of it burning. Start slow- It is highly unlikely that you will go from six weeks to twenty weeks overnight. Pace yourself and go slow to ensure a smooth transition. Start by stretching out one week, sticking with that until you are comfortable, increase it another week, stay with that until you are comfortable. Continue in this manner until you get to your desired amount of time that you want to stretch, preferably twelve weeks or more. Don't be afraid of your new growth- Don't get discouraged when you see your first ripple of new growth. Instead, get excited! After all, that means your hair is growing which is the whole point of this relaxer stretching thing right? One thing that helped me to stretch was to make wrapping my hair a habit, paying special attention to the edges. Even if I didn't wrap my hair I still at least combed it all back and put a scarf around my edges to help lay them down. As soon as I would get home and know that I wasn't going anywhere else for the day I would go ahead and wrap my hair. Also, if I ever wore my hair up, I would basically wear my scarf making sure to cover my edges until I got ready to walk out of the house This helped me be able to train my hair and now I go six months in between relaxers. Moisturize and strengthen- Sometimes when you begin stretching you hair will start to break as you get to and past six weeks. You can help stop this by getting protein treatments to give your hair more strength. Moisturizing treatments will help keep your hair more elastic, allowing it to stretch without breaking. 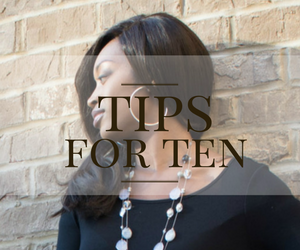 Be consistent- Stretching and wrapping your hair can seem overwhelming at times but stick with it and be consistent. 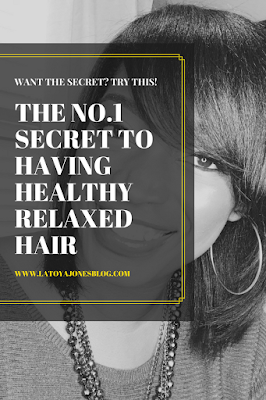 Over time you will see the results, which will be healthy, relaxed hair. Now you are ready to stretch your relaxers out. Have you already started stretching? Share with me how many weeks you go in between relaxers. Love the smooth and shiny look. On the 19Th I'll Be At 26 Weeks! ! That's Six Months! ! Can't Wait To See The Results. great job! Congrats to you!! On the 25th it'll be 6 months for me.. yess. Great post. The hair looks great! I'm at 21 weeks post-relaxer as of today. This is the longest I have ever gone. I will go 25 weeks to the next relaxer cycle. Should you alternate the protein and moisture weekly? Also on protein day would you follow up with a moisturizing conditioner and what protein treatment do you recommend? I normally do it once per month, usually together. Hi. You do a protein/moisturizing treatment only once a month? How do you keep your hair moisturized for a month? I read that you should do a moisturizing treatment every week and a protein every other week. It's a lot of work! My hair is moisturized by using great products. Moisture does not only come from doing moisturizing treatments, the treatments only give a little extra. 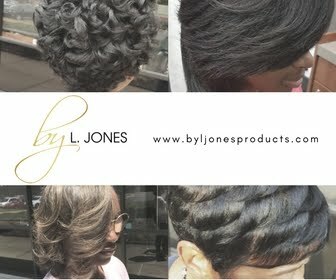 Every other week is not necessary, especially if your hair is healthy and you are using quality products. I did a six months stretch as well two years ago. I was so pleased with the results! My hair was so long and healthy looking as a result! I did weekly deep conditioning with ORS and braided it for the last month. But the results are great and my hair was healthy and not breaking and shedding like crazy. It was inspiring! I am at 8 weeks and usually go to 10 weeks before a touch-up. Several years ago I went natural and it took 1 year to grow the relaxer completely off. My hair is relaxed again but it was during that process that I discovered that my hair will not fall out if I go past 6 weeks. Each time I get a relaxer now I cringe because I know it damages my hair. I am deciding that I want to go longer to keep my hair healthy and reading this blog helps me to decide. I am 63 and over the past 5 years have finally learned how to maintain my hair at home and now it's longer than it has ever been. My goal now is to go waist length just for the heck of it. My key has been to stay away from heat and hair brushes. I roller-set, wrap and try to keep it conditioned and moisturized. I had healthy relaxed hair. I did a 6 month stretch and my hair broke like crazy. Worst decision I've ever made. Its not for everyone. You're right. Stretching is not for everyone. If I go over 5 weeks my hair starts to break and shed really bad. Any recommendations? sometimes the stylist lets the relaxer sit too long on the hair and end up with issues just the same. Today I realized I am 20 Weeks and seven days ! I didnt think I had stretched that long, but I love the idea of having healthier hair . Im proud of myself ! I've been reading your article on stretching relaxers and I now am motivated to do so. But I do have one question. How long should I wait till I get another relaxer? Normally I get touched up 6-8 weeks, mostly 8 weeks. I recently touched up my hair in the middle of April. Would I be wrong if I did my relaxer 10 weeks later, around the middle towards the end of June, or will there be breakage? I've been reading your article on stretching relaxers, and now I'm motivated. I do have a question though? Normally I get touched up 6-8 weeks, mostly 8 weeks. I recently got touched up in the middle of Apirl. Could I touch it up 10 weeks later, towards the middle/end of June, or will that cause breakage? I was wondering if wearing box braids is helpful when stretching your relax hair? september 20th made 9 months that's the longest i've ever gone w/o relaxing new growth... sigh... by the 5-6 month I thought I'd go crazy it was tough... and weird I don't know what caused this... but my new growth was usually very wavy, deep waves,, but since I've strected long like this my new growth seems to be no longer wavy.,, which is a big part why i broke this stretch I was initailly gunning to make a whole year cause my last relaxer before today was december 20th 2014... but I gave up,, couldn't go no more,, it was just too hard. I do mine 3 times per year as I'm trying to grow the length of my hair.